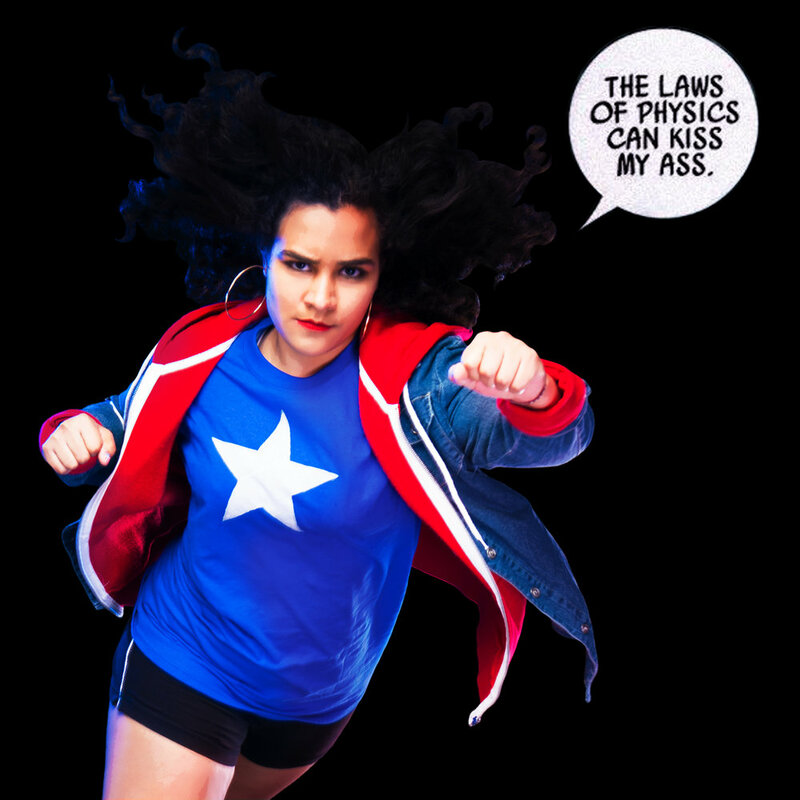 America Chavez is a lesbian Latina teen-Avenger who can punch through entire dimensions. She is published by Marvel Comics, and her current ongoing title, America, is written by Gabby Rivera and published monthly. This shoot features an appearance by Marvel's Ironheart, Riri Williams, the 15yo MIT student who builds her own super suit and succeeds Ironman, with Tony Stark as her mentor. We thought America and Riri might be friends--between the both of them, there's a lot of #browngirlmagic. Thanks to Millena for introducing me to America, and everyone else for going along with this shoot we planned in 3 days. "She's beauty, she's grace, she can punch through time and space." a fan photoshoot based on original Marvel characters. based on a scene from Young Avengers v2 #8, written by Kieron Gillen. Young Avengers v2 #4 by Kieron Gillen. Art by Jamie McKelvie w/ Mike Norton. Color by Matthew Wilson. I'm really excited to launch the belladonna blog with this photoshoot, because I have so much fun with concepts like this one: fun ideas, featuring diverse characters, which simply don't fit with the rest of the issue. Some of my favorite projects have been those I was free to create without a print deadline hanging over my head. And, sometimes, I just really want to share what went into the making of a certain issue--like that time I built a giant kaleidoscope for this cover editorial, and we shot the whole thing using only cell phone lights, because standing lights and flash would have killed the string lights, and what's life without a little bit of stress-induced ingenuity??? So, this blog is where you'll find cool things like: behind-the-scenes pictures, videos, and commentary from the cutting room floor; and, the mini-shoots I direct to test with new creatives like models, stylists, photographers, hair and makeup artists (if you'd like to work with me, reach out, let me know where your interests lie, and let's play!) Welcome to our ~creative playground~. Buy a digital or print copy of belladonna to see what happens when we're not dressing models up as comic book characters. In the meantime, please enjoy this patriotic nerdiness for 4th of July!